Just as Mom always said, your vegetables are good for you; they are loaded with numerous nutrients. These foods can also be delicious and enjoyable, depending on what varieties you choose and how you cook them. Adding butter to your veggies is a classic, quick and easy way to prepare them, and you can serve just about any vegetable as a buttered dish. With very little practice, you can become adept at adding delectable, colorful and creative vegetable side dishes to any breakfast, brunch, lunch or dinner. Add water to your steaming pan setup. How you do this varies depending on the design and setup of your saucepan and steaming pan. In general, however, you will add a couple of inches of water to the pan. Set up the pan so that it is ready for you to add your vegetables to. Place the pan onto your stove's burner. Wash the vegetables thoroughly in water if you are using fresh vegetables. Cut them into your desired shapes and sizes with a paring knife, making sure that they will fit properly into your pan. Place the vegetables into the steaming pan. If you are using frozen vegetables, open the packaging and place the amount of vegetables that you want to cook into the pan. Set the pan's lid onto the pan. Turn the stove's burner to high. Depending on your stove, you might want to turn the setting down to medium-high after the water begins to boil. Set the kitchen timer for five minutes. When the timer rings, carefully remove the steamer pan lid with a hot pad. Pierce one of the vegetables with a fork, being careful not to allow the steam from the pan to burn your hand. If you are cooking more than one vegetable type, pierce at least one of each vegetable because different vegetables can cook at different speeds. Cook the vegetables for a couple of minutes longer if they are not done to your satisfaction. Watch them carefully, because at this point they can quickly go from being not done enough to too done. They are done when they are still bright in color and somewhat firm and crisp. Do not allow them to become mushy. Remove the pan from the stove burner, and remove the lid. 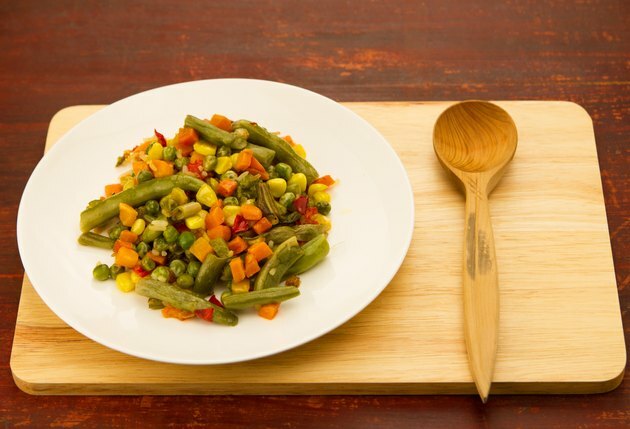 Using a serving spoon, carefully transfer the vegetables from the cooking pan to a serving dish. Slice off a section of butter with a table knife and add it to your serving dish, adjusting the quantity according to your tastes. In general, however, about one pat of butter is a good amount for a serving of vegetables while a tablespoon is suitable for two servings. Stir the vegetables and butter together with the serving spoon. Serve the vegetables along with your main dish while the vegetables are still warm. Use fresh vegetables, if possible, because their tastes, textures and nutritional value are better than those of frozen or canned vegetables. Also select organic rather than conventionally grown vegetables if you can. Feel free to be creative in deciding which seasonings to pair with your buttered vegetables or enjoy the vegetables with just butter. Healthy and tasty vegetable possibilities include broccoli, cauliflower, spinach, carrots, green beans, zucchini, squash and onions. Use caution when steaming vegetables, as the steam is hot and could burn you. Keep children away from a hot stove. Do not overcook the vegetables, because doing so negatively affects their taste, visual appeal, texture and nutritional value. To avoid this, closely monitor vegetables while they are cooking.